When it comes to selecting a spotting scope from the Eterna line, Brunton makes things simple. Brunton manufactures Eterna spotting scopes in three different objective lens sizes: a full-sized 80-mm scope, the mid-sized 62-mm model and the ultra-compact 50-mm version. All are made with extra-low dispersion fluorite ED glass objective lenses. All are available in straight or angled body configurations, and only the 80-mm Eterna scope offers a choice of eyepieces. We received the straight body, 62-mm scope equipped with the 20-45x zoom eyepiece for review. The real appeal of the Brunton Eterna mid-sized scopes is the excellent optical quality in a compact, lightweight scope. The straight-body and angled body models both cost $849.00. At this price, you can afford a decent quality scope that is versatile enough to handle a wide variety of outdoor activities. The first thing you will probably want to know about is the optical performance. The laws of physics being what they are means that all other things being equal, smaller objective lenses gather less light. You may have heard us talk about this before, but the impact of ED glass is that all other things aren’t equal. In terms of image brightness, the Brunton Eterna scope routinely outshines non-ED glass scopes of the same size class. In addition to the ED glass lenses, the Eterna spotting scopes feature BaK-4 glass prisms and Brunton’s proprietary Emerald Fire™ full multi-coating. The sharpness was notably good, and the Eterna stayed crisp right to the very edge of the visual field. We noted no color bias of any kind with the mid-sized Eterna spotting scope. So the optical performance was overall very good. The next thing to know about the 62-mm Eterna scopes is what the small objective lens size buys you: compact size and minimal weight. The straight-body Eterna mid-sized scope is 13 inches long with the eyepiece in place and weighs about 42 oz., or about 2.5 lbs. Much of that weight is due to the dark gray rubber armoring that coats the Eterna scopes: no padded case is necessary for these durable little scopes, although Brunton does include a view-through neoprene case and shoulder strap as standard equipment. All Eterna spotting scopes are waterproof and nitrogen-purged to prevent internal fogging. A simple sighting tube on the left side of the prism housing helps make finding your target a bit easier. The black lens hood slides smoothly out from the body and is easily deployed. As usual, we strongly recommend using the lens hood. A simple tripod mounting foot protrudes from the base, with a standard-sized mounting screw hole and a second hole set properly for the anti-twist pin. The focus knob is just over 1.5 inches long and is partially recessed in the prism-housing, but not so much that it physically limits access. Brunton specifications list the minimum close focus of the 62-mm scopes to be 27 feet and we found this to be accurate. This scope goes from minimum close focus to infinity with around 4.5 turns of the focus knob. Focusing action was notably smooth with just enough resistance to be stable against accidental displacement. The field of view at 1000 yards distance ranges from 95 feet to 58 feet when moving from 20x to 45x magnification. None of these properties are particularly remarkable – just solid performance in all respects. Currently, Brunton makes only the 20-45x zoom eyepiece for the 62-mm Eterna spotting scopes and we don’t know if there are plans for alternative lenses. The eyepiece has a simple bayonet mount that is fixed in place with a ¼-turn twist. While we’re on the subject of the zoom eyepiece, we should say we really like it. The zoom action is wonderfully smooth and there is not tremendous fall-off in optical performance when going from 20x to 45x. The soft rubber eyecup is small enough in diameter to fit comfortably close to the eye. This eyepiece has 17 mm of eye relief, which is enough to be comfortable for most eyeglass-wearers. The eyecup adjusts with a helical-twist mechanism, and there is one position between fully-in and fully-out marked by a very stable detent. Again, we see good practical design at work here. There are basic hard plastic lens caps for the ocular and objective lenses. These fit directly and snugly on the eyepiece or over the objective, adhering nicely to the rubber there. They are easy to put on or remove, but don’t come off accidentally. Due to the design, the objective lens cover deploys nicely whether the lens hood is in or out, a nice little feature. So far as we know, Brunton does not provide any digiscoping capability with the 62-mm Eterna scopes. There are no special digiscoping adaptors available for purchase, so if you want to try photography through this scope, a third-party manufacturer’s product is required. Overall, we like the Brunton Eterna 62-mm ED spotting scope quite well. There is something very appealing about the simple, pragmatic design and no-frills approach. There may be circumstances where you want a larger ED glass scope, but be prepared to pay a lot more for it, as much as 2-3 times as much. 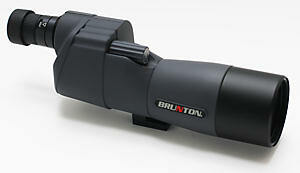 The Brunton Eterna scope is designed to pack a lot of optical performance into a compact, lightweight optic. This is a great little scope for throwing in a backpack when hiking, or for tossing in the car on the way to the shooting range, or in your carry-on baggage when traveling. The Eterna mid-sized scopes are made to be rugged and affordable, not fancy and expensive, and in this, they succeed admirably well. Brunton has discontinued all their spotting scopes. 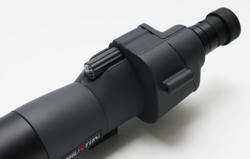 The Pentax PF-65ED-A II 20-60x65 Angled Spotting Scopes is a very good alternative to the Brunton Eterna spotting scope.